The more I contemplate and discuss possible approaches to life after levels, the more I find myself thinking that my own subject might have some good practice to share. I don’t know why it has taken me so long to reach this conclusion – after all, Classical subjects have never been part of the National Curriculum and so they have never had any National Curriculum levels. No wonder we’ve already got a workable alternative in place! DIRT is one of those lovely acronyms which the educational world is so fond of. It is short for Dedicated Improvement and Reflection Time – which is one of those fancy terms the educational world is also fond of. Both the term and the acronym are relatively new, but the principles associated with them will be familiar to all good teachers. 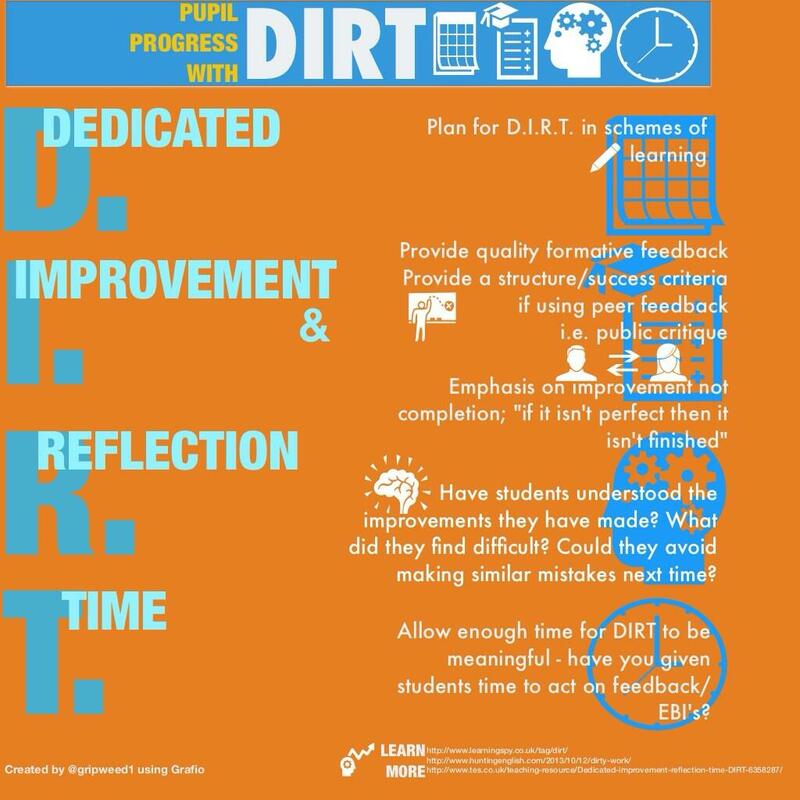 Essentially, DIRT is all about setting aside time, either in lessons or otherwise, for pupils to actively engage with the feedback they receive, hopefully improving their knowledge, understanding and skills as a result. We have been doing this in the Classics department for several years now, and it certainly makes a difference. You may be doing something similar already, but in case you’re not I will explain here how we use DIRT in our teaching, and you can decide whether it might be both possible and desirable to adapt it for use in your subject. I’ll take you through our typical approach to teaching a new language point to a Latin class. I will offer some examples of Y10 work to support this, but these principles work just as well in KS3. 1. Pupils work with a passage of Latin which contains a language feature they have never seen before. After they’ve worked out what the passage is about, we ask them questions or set them activities designed to help them spot the new feature for themselves, and then we encourage them to explain what they think is happening. 2. After this, we formally explain the new feature, working together on a few more examples to help clarify the idea. 3. The pupils complete independent or group activities designed to help the idea really set in. They self-assess or peer-assess this work. We check understanding by asking them to share their marks (“Hands up if you got more than 7/10!”) or by asking them to verbally explain how they arrived at their answers (“How did you know that a command was being given?”), and so on. I often use lollypop sticks and Pose, Pause, Pounce, Bounce at this stage – see the page on “Class discussions” for more on this. We then ask the pupils to record in their own words what they have learned – DIRT part 1! 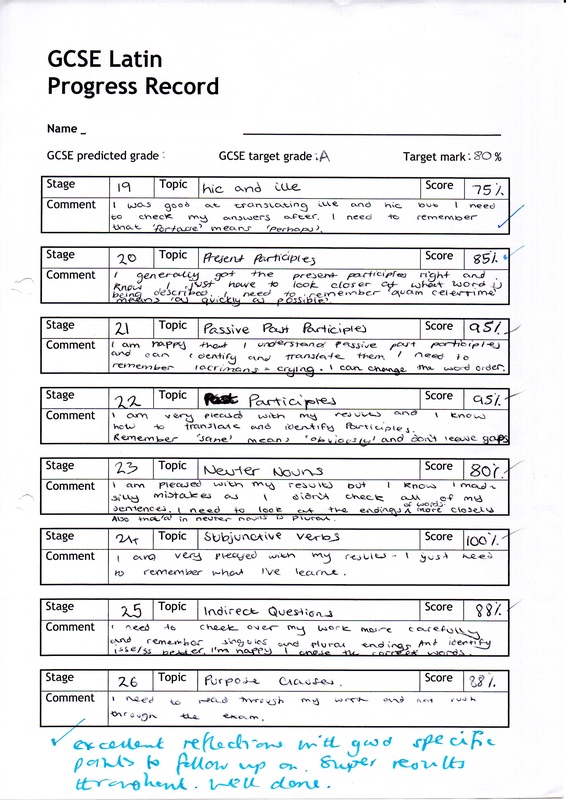 Here are some examples – click on the images in order to enlarge them and read the pupils’ comments. More text below! 4. Having got the basic idea by this stage, we do something completely different for a while, and then in a subsequent lesson we will do a refresher activity on the new feature, often as a starter. This break is worked in deliberately because research has shown that new learning is processed most effectively when it is moved away from and then returned to in this way – ideally about 2-3 days after the initial encounter. 5. We ask the pupils to prepare for an assessment on the new language feature. We offer advice on how to do this, and over time each student will develop approaches which work well for them. 6. 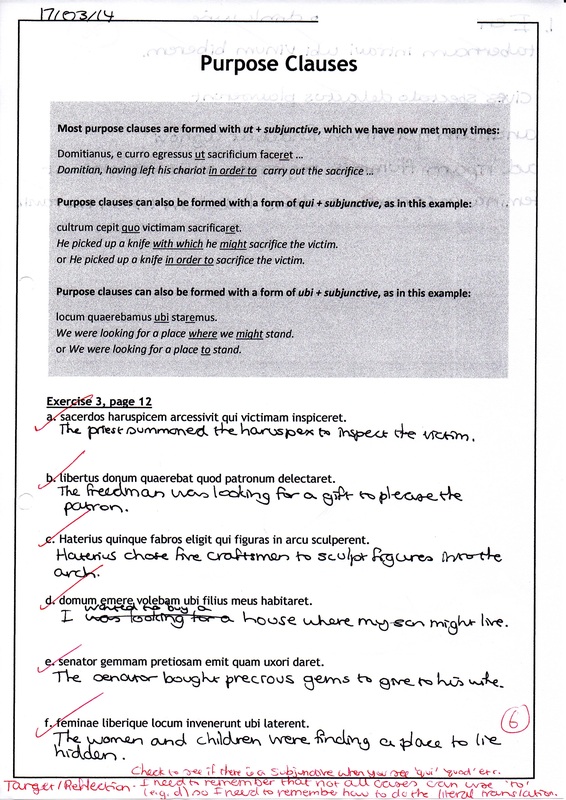 Pupils sit a short assessment containing 5 Latin sentences. First the pupils have to work on the Latin in some way (e.g. underline a certain type of word, add in a missing word or complete a word): this will relate solely to the new language feature. Next the pupils have to translate the sentences into English. This will require them to deal with the new feature, and also to pull in previous learning, so that old ideas are not forgotten. We allow them about 5 minutes for them to do these tests, and it takes us about 10-15 minutes to mark a full set. 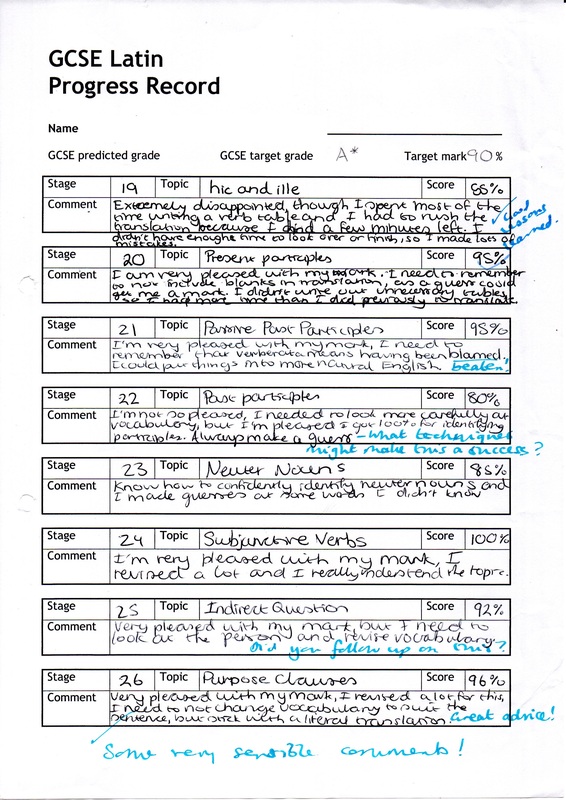 In Y10 & 11, we use GCSE marking criteria and grade-boundaries – we would have no trouble doing the same in KS3 too. One of the reasons the marking is so quick is that we correct nothing. Instead we highlight the bits of Latin they have got wrong, and maybe add a question or two to help them work out why. 7. We return the scripts to the pupils and tell them to make corrections. There is also an extension task to provide an extra challenge for those who made very few mistakes. DIRT part 2 has begun. Pupils are only given two or three minutes to do this, and are expected to use the Brain-Book-Buddy-Boss approach to work out what they need to change (see the page on “Resilience” for more details on this). After a couple of minutes we go through the answers together, naturally spending more time on any areas which caused the pupils particular problems pupils. Again, click on the images to enlarge them. More text below! 8. The pupils now fill in their “Progress Record”. They note the name of the language feature and the score they achieved, and then they comment on the key points they need to remember in the future – this is DIRT part 3. This is something they tend to get better at with practice. As before, click on the images to enlarge. More text below! 9. As you can see from the above examples. we take in and read their progress records to check that the pupils are making appropriate notes. 10. 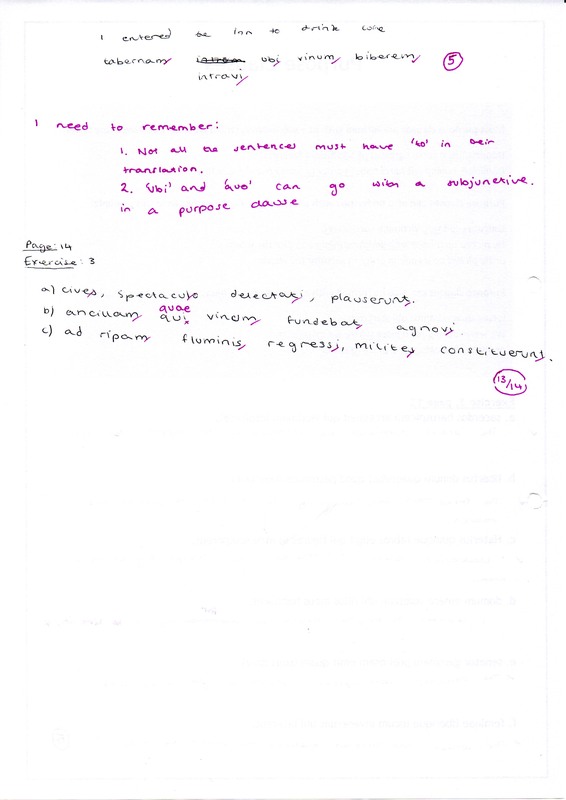 When it is time to sit a bigger assessment such as an exam, we encourage the pupils to make sure their progress records are used to help bring focus to their revision – reminding them of key learning points, and highlighting areas which are likely to need extra attention. This is DIRT part 4! Pupils sit these tests roughly every 4 lessons, so we’ve always got plenty of data to hand whenever we need to comment on their progress. More importantly, our approach to assessment really helps the pupils to build a sound overall understanding of the subject. This may all seem very formulaic: in terms of structure it certainly is, and deliberately so – the more familiar the pupils become with the format, the more expert they become at getting the most out of their DIRT. Despite the repetitive nature of the approach, it doesn’t feel boring or unproductive, because we use plenty of variety in our teaching and in the activities we set. The pupils enjoy these opportunities to check that they are making good progress, they prepare sensibly for the assessments, they take the reflection time seriously, and all of this helps to keep their confidence high despite the many challenges this subject can present. Do you already do something similar in your subject? Can you share any extra thinking on this? If not, is there scope for your subject to take on this sort of approach, probably with some adaptation? Could we have here one potential strand in an effective approach to life without levels? As always, please do share your comments and questions! This entry was posted in Assessment, Learning Skills, Teaching skills and tagged Classics, DIRT, Latin, Levels, reflection. Bookmark the permalink.